There was a time not long ago that the market was all FANG all the time, and by FANG we not only mean the four stocks that make up the acronym but also the other members of the group that makes up the FANG+ Index. The FANG+ Index was created probably more like a marketing gimmick than anything else, but in addition to the likes of Facebook (FB), Amazon (AMZN), Netflix (NFLX), and Alphabet (GOOGL), it also includes other high growth names like Alibaba (BABA), Apple (AAPL), Baidu (BIDU), Nvidia (NVDA), Tesla (TSLA), and Twitter (TWTR). Looking at the various names that make up the group, a number of them have fallen on some hard times of late and have been underperforming the broader market. This recent underperformance has also been reflected in the breadth of the FANG+ index. As we have highlighted in a number of our reports over the last few weeks, the S&P 500’s cumulative A/D line has exceeded its highs from last fall. The FANG+ stocks, though? Not so much. In fact, it’s not even close. 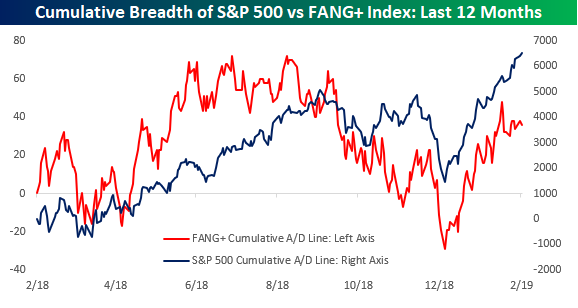 As shown in the red line below, breadth for the FANG+ stocks actually peaked early last summer and failed to make a new high when breadth for the S&P 500 made a new high last September. Even more troubling for the group in the short-term, though, is that even as breadth for the S&P 500 made new highs this week, cumulative breadth in the FANG+ index is still well off its highs from early February.